Readers: thanks for your patience; blog entries resume now that I’ve returned from Europe. Of all the towns we visited on this Holland-America cruise, Stockholm was the winner. The buses there are boats -they run on water, you Hop-On and Hop-Off and these charming little launches putt-putt around the town, depositing you at any one of a dozen locations. The gulls and ducks in the harbor fly and paddle cheerfully alongside the variety of sea-going vehicles: launches, skiffs, catamarans and yachts; you glide by office buildings topped by steeples, residences crowned with turrets -the architecture expresses a buoyancy of spirit, the optimistic character of the inhabitants is revealed through the cityscape, it’s simply enchanting. The amusement park gives a kind of Pleasure Island feel to the place, with kids happily packed into roller coasters or dropping from immense heights from stomach-wrenching towers. There’s one of the most dramatic museums I’ve seen, the Vasa Muset. 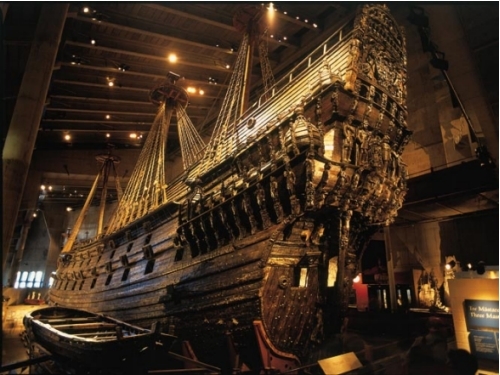 The Vasa was a 250 foot warship that sank in the bay minutes after being launched. For three centuries it lay on the harbor floor until raised and reconstructed in the 1960’s. You think the Titanic’s impressive? This ship hangs suspended, looming over you in a cavernous space three stories high, theatrically lit as if by Natasha Katz. A towering leviathan, floating twenty feet above your head. On the second level you can see the carved wooden figures decorating the hull, from cherubs to kings, with the proud Swedish lion under the bowsprit. Simply breathtaking. And of course there’s a gift shop, with mugs and place-mats and T-Shirts all displaying the ship’s image. Do yourself a favor -search Vasa Museum on Google. Monday I’ll post evaluations of the other cities we visited, plus, in future, a critique of Holland-America. You are living the good life and I’m thrilled for you! Did our song get good response?